Cu/Mo/Cu (CMC) is a sandwiched composite comprising a molybdenum core layer and two copper clad layers. It has adjustable CTE, high thermal conductivity, and high strength. 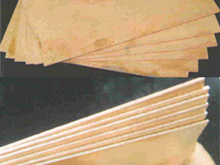 All types of Cu/Mo/Cu sheets can be stamped into components.